This was the first of my blog posts that discussed a work of Mennonite literature. As with the Complicated Kindness post, I focus here on the intersections of Mennodom and alcohol, though there really aren’t a lot of intersections in this work. Still, I felt that the book had been reviewed enough in the general press and the presence and absence of alcohol was barely remarked upon. I’ve done a whole new edit of the piece. The drink is still the same. 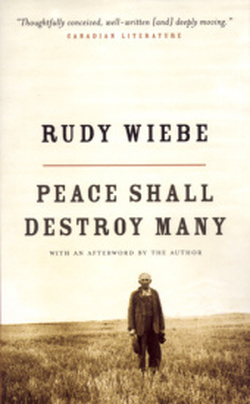 Pretty much every review of Mennonite literature in Canada starts with Rudy Wiebe’s Peace Shall Destroy Many. Wiebe’s been called the father of Mennonite literature, though by now I think it might be more appropriate to call him the Granddady (or Opa) of Menno lit. In preparation for this blog post, I read a few reviews, and tested a few recipes. I also reread the book. The novel follows Thom Wiens, a young man coming of age in a secluded Alberta Mennonite community in 1944. It deals with universal themes of growing up — questioning authority, learning to deal with conflict, racism, romance and sexual attraction — and particular Mennonite themes of the meaning of non-violence, aspirations of communal unity, and the tension between evangelism and isolation. Other reviewers and commentators have reflected on many of these themes. Given the conspicuous absence of alcohol in the novel, it is, perhaps, not surprising that none of these reviewers have reflected on the place of booze in this seminal Mennonite work. Without knowing how to read between the lines, you could, in fact, be excused for thinking that alcohol played no part whatsoever in the plot line. The Drunken Menno is here to help. Though not mentioned often, booze plays the part of opposition to the tightly wound Mennonite community. Early in the novel, we are told that the non-Menno who ran the local general store had gone “broke because of drink” two years before the advent of the novel. The book’s antagonist had bought up the store and kept the guy on to run it, though without any liquor. Liquor was explicitly part of the “other” in the novel. In addition to the Scottish storekeeper, a Metis farmhand imprisoned for drunkenness is the only other character to openly drink. That doesn’t mean that there was no more drinking. We are told that wild blueberries and saskatoons are preserved for the winter — presumably some of them made their way into jams and the rest were carefully fermented and bottled as wine that would be brought out to share with all at Christmas, and drunk on the sly the rest of the year. One of the lesser villains of the story threw a brown bottle across the room in a fit of rage. It could have been a medicine bottle, I suppose, but I think it’s fair to assume it was a whiskey bottle, purchased in some neighbouring town where the storekeeper was less tightly controlled. The book ends with Thom and his family heading home after a successful school Christmas program that was followed by a brawl. Drunkenness didn’t contribute to the brawl. Only coffee had been served at the Christmas program. Still, I like to think that after Thom got home, he may have slipped off to that secret room where his mother kept the saskatoon berry wine and his father the bottles of whiskey he’d held onto since the drying of the shop (and which he surely dipped into to help him keep so steady through those endless Church meetings). Combining the two, Thom would have made something like a Manhattan — the perfect drink to help him settle down, work up the courage to propose to Anna Maria, and set the course to steer his community in a new direction. Place the berries and whiskey in a small jar with a tight lid. Shake to quickly mix the berry flavour into the whiskey. Fill a short glass 3/4 full of ice. Add the whiskey, vermouth and bitters. Stir. Garnish with a few of the berries. BTW, I should have mentioned this already. Rudy Wiebe wrote about an isolated Mennonite Brethren community (that was pointedly different even from other MB communities in its isolationism), though he only ever calls it Mennonite. Mennonites know that they were MB’s from the description of the baptism by immersion. I’d just like to point out that I’m not that kind of Mennonite.